On January 7th, 2014, John Law—neon sculptor and artist, original member of the Cacophony Society, and co-founder of the Burning Man Festival—is launching a Kickstarter campaign to raise $48K in 30 days to restore the trio of mobile mascots of the now defunct Doggie Diner. As steward of the Doggie Diner heads, John Law has been bringing them to charity events, local music shows, parades, and other civic and cultural events across the Bay Area for the past 25 years—free of charge and at his own expense. After years of traveling far and wide providing delight and merriment to the citizens of the greater Bay Area, these canine icons have sustained serious structural damage, which if unattended will be irreversible. We need to raise $48K on Kickstarter to get the work done now. The old steel frames inside the fiberglass heads have become corroded after years of exposure to salty air, and will be replaced with galvanized steel and new sturdy base plates will be made for each Dog. The damaged fiberglass will be reinforced and a complete repainting will be done with UV-resistant paint. Finally, the hauling trailer and truck needs to be repaired so that we can continue to bring them to events in a safe and reliable manner. The dog heads are vintage signs from the now extinct local chain restaurant, the Doggie Diner. From the 1950’s through the 80’s, San Francisco, Oakland, and Peninsula residents all patronized the Doggie Diner restaurants and were greeted by the giant, rotating dachshunds that hovered above many of the two dozen restaurants. 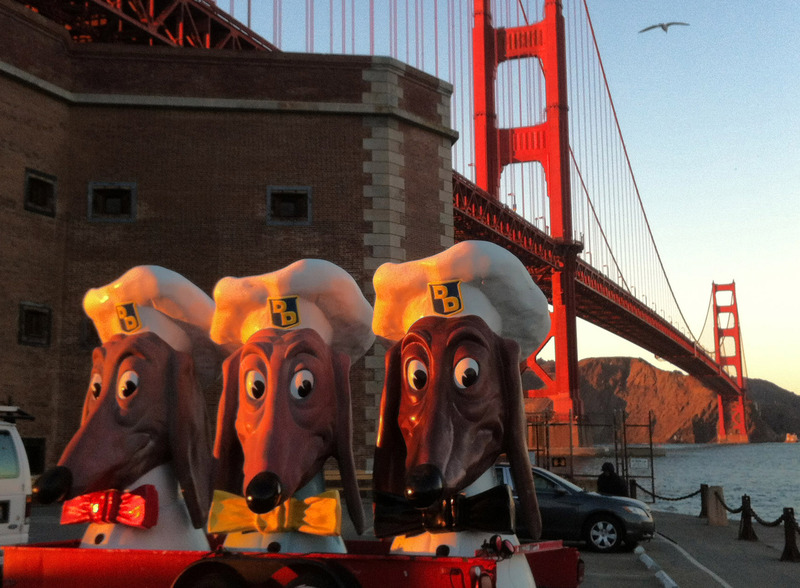 To many living in the San Francisco Bay Area, these enigmatic Doggie Diner heads are a much-loved relic of our living past, a local treasure, and part of our history. As much a part of the Bay Area landscape as the Golden Gate, City Lights Books, Coit Tower, or the Rainbow Flag in the Castro, the Doggies have established a national, even international image. They are mascots of the Cacophony Society and The Annual St. Stupid’s Day Parade (now in its 34th year). Cartoon artist Bill Griffith recruited Doggie Diner as a character in his world renowned comic strip Zippy The Pinhead back in 1978. Dozens of other artists have been inspired by the Dog heads, like Phil Frank, Tom Meyer, Ron English, and international fiber artist Olek, just to name a few. 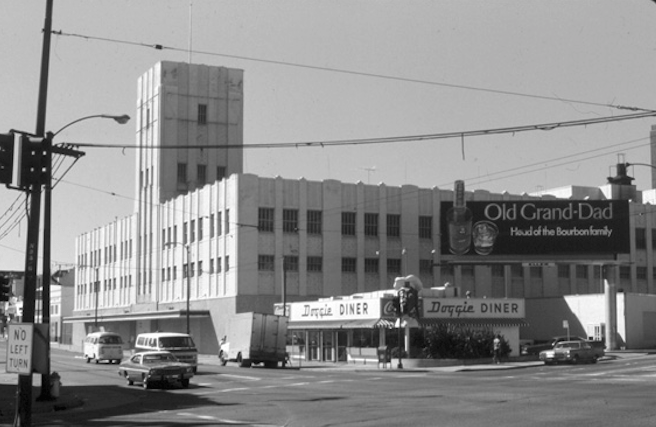 Additionally, the Doggie Diner heads were officially recognized as having historical significance by the city of San Francisco on August 11, 2006, when one of the last standing Doggie Diner heads, currently located in the Outer Sunset neighborhood, was restored and refurbished by the city of San Francisco and became a San Francisco landmark. This project will only be funded if we raise all of the $48K by Saturday, February 8, 3:00pm PST. 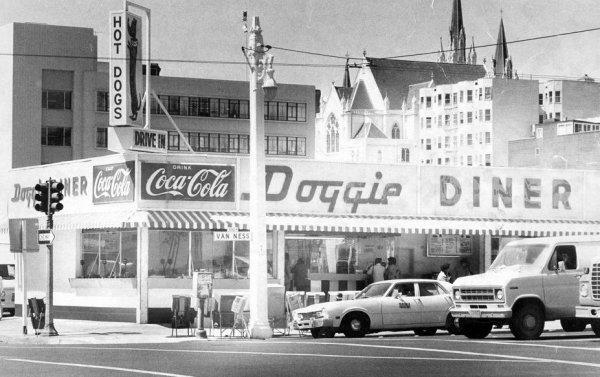 Find us by going to the KICKSTARTER website and typing “Doggie Diner” into the search box, or visit us directly by typing this link into your browser: bit.ly/DDmakeover Consider donating as little as $1 to help us keep this vestige of The City’s past from fading away like old photographs.